Shell has clear requirements and procedures to prevent operational spills, and multibillion-dollar programmes in place to maintain and improve our facilities and pipelines. However, spills still occur for reasons such as operational failure, accidents or unusual corrosion. Our requirements include establishing and implementing spill response plans. In 2013, the volume of operational spills of oil and oil products amounted to 0.9 thousand tonnes, down from 2.1 thousand tonnes in 2012. 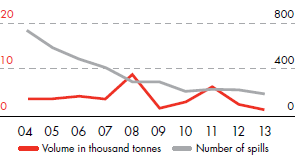 The number of operational oil spills also decreased in 2013 to 174, down from 207 in 2012. These are the lowest levels recorded and continue the long-term improvement trend. We continue to investigate and learn from all spills to help improve our performance. We are working to extend the significant improvements made in previous years to decrease the number of operational spills through our ongoing investment in improving the maintenance and reliability of our facilities. In 2013, sabotage and theft remained a significant cause of spills. The scale of oil theft in Nigeria escalated, leading to multiple shutdowns of production. This was reflected in the number of spills due to sabotage and theft increasing to 157 spills, from 137 in 2012. 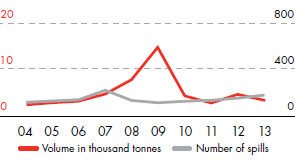 The volume of these spills decreased to 2.2 thousand tonnes, down from 3.3 thousand tonnes in 2012. See “Nigeria operations” for more information on spills in Nigeria.